This was a fairly recent post; originally posted in October of this year. A friend and fellow dietitian recently send me a PDF of an interesting document: Healthy Food Choices: Good Reasons to Recommend Foods of Animal Origin. Unfortunately, I can’t seem to find a link directly to the document to share with you. The link I’ve given will take you to the Beef Order Centre where you can download the PDF. If you’ve been reading for a while you know that I’m not a vegan or vegetarian. However, I don’t eat meat every day, or even every week and you know that I’m no big fan of cow’s milk. This publication rubbed me the wrong way. 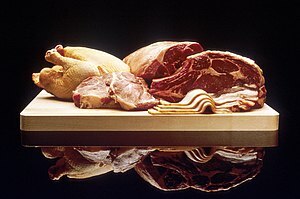 While it was written by a number of highly credentialed dietitians it was also “prepared through the collaborative efforts of: Beef Information Centre, Canada Pork, Canadian Aquaculture Industry Alliance, Canadian Egg Marketing Agency, Canadian Poultry and Egg Processors Council, Chicken Farmers of Canada, Dairy Farmers of Canada”. I think that pretty much covers every animal product marketing board in Canada. How can anyone give much credibility to a document encouraging people to eat more animal products that was essentially developed by the people who make money off the sale of said products? The arguments they give are that Canadians aren’t consuming enough of certain nutrients (several of the ones listed don’t even come from animal products; i.e. vitamin C, folate, and fibre). In addition Canadians consume too many foods that aren’t part of the food guide (“junk food”), and we aren’t consuming enough from any of the food groups. No mention of the fact that the food guide is inherently flawed and even if it wasn’t, it’s just a guide not gospel. Even if we’re not eating enough servings from the meat and alternatives food group, or from the milk and alternatives food group (which I’m dubious about) there’s a key word in both food groups that they seem to have over looked: alternatives. Yes, this means that you can eat other (non-animal) foods to fulfill your needs from both food groups. They don’t even mention any of these foods, or the fact that many nutrients contained in animal products are readily available in plant foods and generally speaking, plant foods tend to be healthier than animal foods. I’m usually far more concerned about people consuming too few vegetables and fruits than I am about them consuming too few servings of meat. Honestly, I think it’s shameful that dietitians would allow their names to be associated with such a publication. Then again, maybe that’s why I can’t find work in my field. Tags: reblogged, top posts | Permalink. Sell-outs are reprehensible. I read your blog because I feel I can trust what you say. Keep up the great work.